Lots of bunnies for your designs. The images shown above have been greatly reduced. Not all of the bunnies are shown–there are simply too many! And they appear to be multiplying. Help! Funny little bunnies in just about every color for your Easter designs. An early spring bunny collection. Great for Easter and the rest of the year to boot. I’d intended to create 100 bunnies, but you know how rabbits are, and this package quickly grew to 107 bunnies. 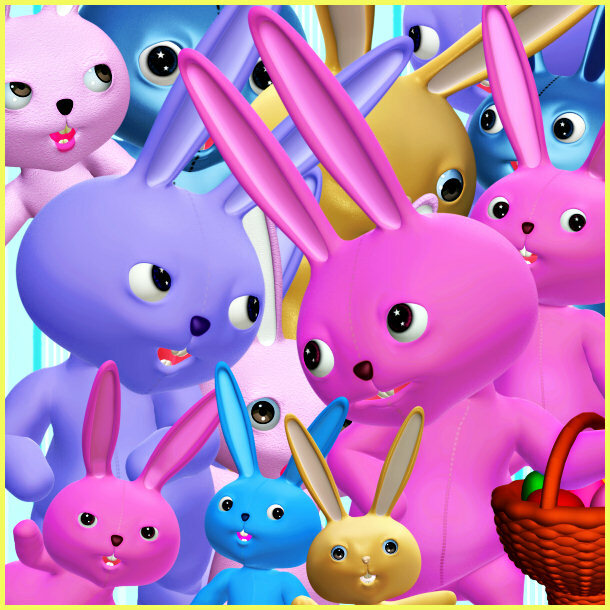 They come in a variety of springtime pastels, but there are a few odd rabbits in the mix as well, including a green St. Patrick’s day rabbit, and some Goth rabbits with burlap bodies, which aren’t shown in the promos. I’m throwing in the Easter baskets I used, which were included in my previous Easter rabbit collection, for your convenience. The seamless tile is not included in this package. There are 109 royalty free, high-quality clip art PNG images in this package. All of these graphics have transparent backgrounds, making it easy for you to use them as tubes or nozzles–or merely to drop into your design. The size of these images varies but most are 1200 X 1800 . All are 300 DPI, making them great for print projects. Members can use the tubes for personal or commercial projects, including web design, template design, graphic design, t-shirt design, candy wrappers, scrapbook designs, and for signature tags, but please read my terms to learn more. If you have any questions, please email me. This package has been divided into 2 zip files which are approximately 60-70 MB each.